A few flurries of activity within the Web analytics community surfaced this week including the launch of Coremetrics 2009, a hearty product upgrade, and Yahoo! Web Analytics’ official coming out party. I’ll begin with the Coremetrics upgrades which are focused around the theme of “Know Your Visitors”. A longstanding tenet for Coremetrics, they believe that Web analytics clients are interested in people and the ability to identify and understand as many unique individuals as possible. This knowledge can be used to target offerings at both the individual and segment level creating a better experience from both an online and offline perspective. Coremetrics makes this possible through their LIVE (Lifetime Individual Visitor Experience) Profile database which essentially creates an analyst’s playground of customer insight. 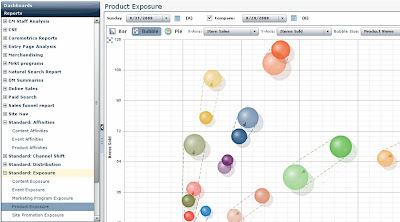 The Coremetrics 2009 release (publicly available for clients as of 10/6), features: enhanced benchmarking, new charting capabilities and drill-down functionality (within their visualization platform), and mobile analytics. Coremetrics and Google Analytics are the only two offerings currently providing benchmarking capabilities, so if you’re looking for competitive intel, you know where to find it. Both tools provide key comparative data allowing you to understand metrics such as visits, bounce rates, page view and time on site in the context of your site against a competitive set. At this time, Coremetrics offers more benchmarking reports and ones that are specialized for verticals (e.g., retail, publishing). Coremetrics' new Relational Zoom tool allows clients of their Explore product to identify relationships within categories and apply them to segments for heavy duty analysis. And finally, the mobile analytics solution sheds some much desired insight into how visitors on the move are connecting and what they do via mobile devices vs. sedentary laptops and desktop machines. Yahoo!’s news revealed that final integration steps are complete after just 5 months from the acquisition of IndexTools. Users of the updated tool will be able to access the interface through a single sign-on via standard Yahoo! accounts (existing IndexTools clients will use a backdoor login to the legacy interface). The official launch does not provide open access to Web analytics for the masses (which was originally speculated by some in-the-know), but according to Dennis Mortensen, the new product genuinely isn’t designed to compete head to head with products already on the market. With so many underutilized analytics solutions out there today, Yahoo! is taking a strategic approach by allowing an initial wave of 15,000 Yahoo! Store owners access to the tool. For these lucky store owners (and yes, there is already a waiting list as requests were rolling in every second of the day yesterday! ), this is a huge win providing key insight into their pages and carts to understand what’s happening with customer visits leading up to the holiday shopping season. These 15 thousand Yahoo! Store owners can now enable analytics with the flip of a switch that automatically tags pages at runtime. Nice! Further, the standard installation will deliver with preformatted reports (much like Coremetrics’ approach), designed to key in on important eCommerce variables, with the goal of providing instant insight. 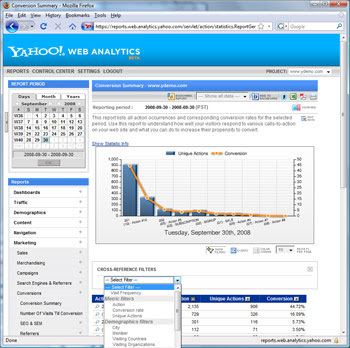 Advanced users will still be able to customize reports within the Yahoo! interface, create dashboards and tag to suit their more complex needs. Roll-outs will continue throughout Q4 and extend into next year ultimately providing access to tens of thousands of additional Yahoo! customers over time. Support will be offered through existing Yahoo!’s Store resources with additional backup coming from their partner network for professional services. Dennis wrote up an enthusiastic post with tons of great screenshots, so check it out if you want to see more. In summary, October is shaping up to be a big month for Web analytics activity and we haven’t even hit eMetrics yet. I anticipate more big news from vendors at this event, so if you’re on the fence about heading to DC for the industry’s marquee event, then get over it! I’ll be there, so please track me down if you want to talk analytics, testing, targeting or anything else for that matter. Ah, but you have to ask yourself if Yahoo! is done rolling out IndexTools or if they still have designs on competing in a wider market (i.e., outside of Yahoo's existing ecosystem of customers and partners)? Anyway, nice to see you blogging again after the Forrester acquisition! Perhaps the calibration on your magic eight ball is finely tuned, yet my sources say that a free for all launch of Y!WA is not forthcoming anytime soon. Yet, I too am pleased to see that progress is happening because the opportunity costs are tremendous and we know that no one else is standing still, so late entrants will only have a bigger game of catch-up to play. Thanks for your comments and see you in DC!